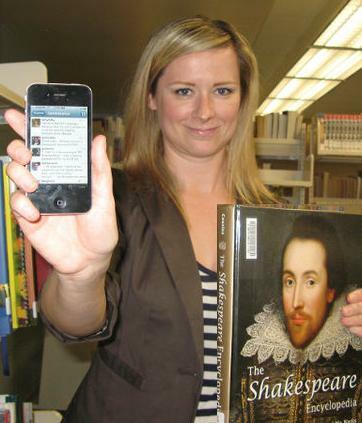 The internet is a growing teaching resource and tool, especially when approaching Shakespeare and literature. Digital Theatre projects like Such Tweet Sorrow and Much Ado About N<3thing doubled as insights into familiar characters as well as cautionary tales regarding responsibility, communication, and cyber-bullying. We’ve discussed Twitter and Facebook’s influence on student–teacher communication before, but one teacher has recently been commendably profiled for using Twitter to teach Hamlet. As part of their Shakespeare unit, students create Twitter accounts for characters from Hamlet — from Rosencrantz and Guildenstern to Ophelia and Queen Gertrude — and send out tweets as they work through the acts. It’s not fabulous that they’re not playing with the actual language, nor are they exactly on their feet with the text – however, you can’t deny that Mrs. Barker’s students are invested in the play. Barker gets her students to blog regularly as part of their novel studies unit. She posts discussion questions to the blogging site Ning and students have to write entries, comment on classmates’ posts and use content tags. “It’s, like, a collective knowledge. You can look back at last year’s blog posts,” said Erin Kope, 17. Classmate Connor Swick, 17, agrees that blogging is a great educational tool, especially for collaborating with other students. “If it was in essay form it’s not like you could go over and read everybody’s essay. People get their ideas out and everyone can share it,’ he said. We do a similar project with our High School Fellowship classes where each day of the course a different student is asked to blog their perspective on the lecture, discussion, rehearsal, or performance, and everyone is required to comment a certain number of times. Sometimes the discussions that blossom without our involvement are pretty spectacular. What do you think? Is this #Shakespeare approach going to help students relate to Shakespeare better? Are we sacrificing language and performance to use it? Could they be incorporated together? We take a break from this Festival week to discuss clothing and costumes in Shakespeare’s plays. Though costumes are not required or even recognized in our Festival, there’s definitely a lot to discuss about them! In other words, you knew a great deal about a person—income, social status, and importance—just by paying attention to what he or she wore. Shakespeare used this association between clothing and identity, and uses that association to great advantage. In Hamlet, Polonius proclaims “Apparel oft proclaims the man” (I.iii, 70)—an effectively way of reminding the audience that clothing has a great deal to do with identify and personality. Productions sometimes make dramatic use of this idea, as in a production of Henry IV where Prince Hal must evolve from the young ruffian who hangs out in taverns to the young man who will become king (and eventually lead his nation in war in Henry V). When the character is transformed, he leaves behind his common clothing and is dressed in a golden suit of armor. Even his gait is transformed as he walks stiffly toward Falstaff. Still dressed in the common attire of their ale house days, Falstaff cannot help but be aware of the character’s complete transformation. The association of identity with clothing is no longer controlled by the queen, but it is no less evident in today’s society than it was in Shakespeare’s. What do students think of Shakespeare’s use of clothing to create and confuse notions of identity? What does clothing mean to their identity? What elements of costume can you use in your classroom to explore these connections? ~excerpts borrowed from Docent and Teacher Amy Thompson at thirdwitchfirstmurderer.wordpress.com. This past weekend, a young couple, Colin and Stephanie, came to the Folger for a tour (which Amy gave), after having performed in the Secondary Festival many times together when they were in high school. Since it was a beautiful day in Washington, DC, I decided to begin the tour outside in the Elizabethan Garden. I am not a particularly adept gardener, so we breezed through the horticulture quickly and headed to the statues by Greg Wyatt. The first one we came to depicts Shakespeare’s play The Tempest. Mr. Wyatt’s sculptures are somewhat abstract, and his interpretations of Shakespeare usually require some decoding. But that didn’t matter much to my group; The Tempest to them is the play where Colin played Ferdinand and Stephanie played Miranda, as they told me. “Ah, the young lovers,” I said. We examined the friezes on the front façade of the building and I learned that Colin is not a big fan of Macbeth, but Steph would love to be a witch, which just goes to show what a clear-headed girl she is. They have never done Hamlet and Ophelia, but yes, he was her Romeo and she was his Juliet. As we continued the tour inside the building, a librarian from Memphis joined us. We looked at the stained glass in the Founders’ Room, the current exhibit on “Shakespeare’s Sisters,” the permanent display of Shakespeare’s First Folio, and ended up in the Elizabethan Theatre for a few final words about Shakespeare’s plays. I then invited them to take photos in the theatre if they liked, or follow me out to the lobby for questions. The librarian and I went to the lobby and watched what happened next from the doorway, along with two of the Folger guards. Colin took Steph up onto the stage so his parents could take their picture. Afterward, he turned to her and let her know, in a few short sentences, how much she meant to him. Then he knelt, pulled out a ring, and asked her to marry him. The crowd of friends and relatives who had been hidden in the dark balcony broke into applause, and came downstairs to celebrate with the happy couple. I was a little choked up; the librarian from Memphis was absolutely in tears. As far as I know it is the first time that someone has proposed on that stage when it wasn’t part of a script. Did Shakespeare bring the two of them together, or would they have found each other regardless? When Steph, as Juliet, looked deeply into Colin’s eyes and said “My bounty is as boundless as the sea, my love as deep; the more I give to thee, the more I have, for both are infinite,” did it speed things along? What would have happened if Colin had played Trinculo and Mercutio instead of Ferdinand and Romeo? I don’t pretend to know. I do know that Colin and Steph are in love with Shakespeare and each other. As I gaze wistfully out of my window, pondering how useful it would be to attempt business on a laptop in our Garden for the rest of the afternoon, I wonder if any of your students are feeling the itch to be Out of Doors as well! Yes, the chorus of “Can we have class OUTSIDE? !” can be a little tedious, and you know it’s just an excuse to have another recess, but what a difference being outdoors can make on their Shakespeare! As we know, many Shakespearean festivals all over the world still perform outside, and some even without stages or lights at all! In the Globe itself, performances went on with the open air right above the groundlings’ heads. What sort of impact did this make on their performances? How does it change the experience now? Try a few of your activities outside on a nice day, and let us know how it goes! I’ll let you know if the laptop-Garden situation ever resolves itself, too. At the Folger, March kicks off the annual festival season. Beginning next week, students and their teachers from 56 secondary schools in and around DC will come to tread the boards of the Folger theater. What a celebration of Shakespeare’s language! Fourteen hundred students will present scenes, abridged versions (using Shakespeare’s language), and montages from 19 of the plays during the seven day festival. It’s not competitive. There are no first, second, or third place finishes. Everyone wins. It’s a celebration. The atmosphere at the Library is high energy, to be sure, but it’s only the beginning. 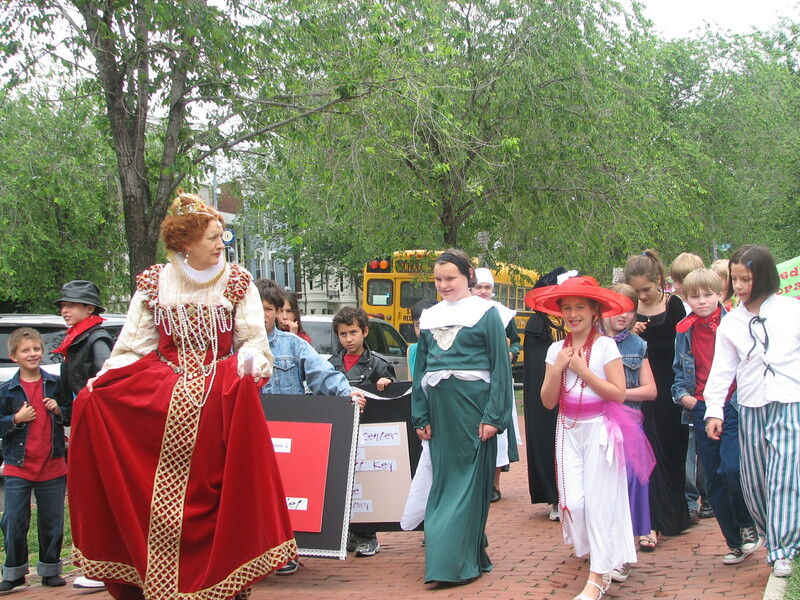 In May, students from 30 elementary schools from the area and as many as 10 from Capitol Hill will participate in the Emily Jordan Folger Children’s Festival and Shakespeare At School. 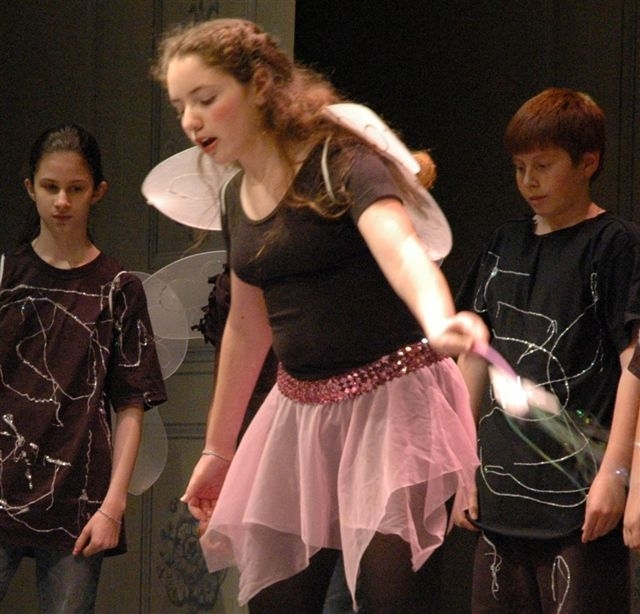 Having hundreds of students in grades 3-6 speaking Shakespeare’s lines on stage, performing scenes from the plays — and understanding what’s happening in those scenes — is incredibly exciting, and not to be missed. Are your students participating in a festival this spring? What have they chosen to perform? A plague a both your houses! Most teachers might think that arming students with a host of insults and asking them to hurl them at each other is NOT a good idea. But, in teaching Shakespeare, it can be the beginning of a fun learning activity. I had the opportunity today to watch two master teachers gather students on the Folger stage and teach them what it means to play with Shakespeare’s language. The plays are full of insults, and these are marvelous sound bites to help students connect language, expression, gestures, and meaning. In the first activity, two students faced each other, each with a short insulting phrase. Students had a few moments to review the words, determine meaning, and think tone and gesture that would really get that meaning out to the audience. Then, one pair at a time, students hurled the insults. I use the word “hurl” because the delivery of the lines was physical—in fact, it was palpable. The students threw themselves into the activity, making faces, shouting, narrowing their eyes, turning toward or away from the other person—all movements that reinforced the meaning of the words. The second activity gave students a chance to build a scene. The teacher provided a more extended disagreement between two characters. A small disagreement grew into a shouting, gesturing match as students literally built on the words with their actions. By the end, there was no doubt about meaning and emotion spilling off the stage. Using insults and arguments is a great tool for helping students take words off the page and give those words real meaning. They are able to make strong connections through their emotions—something students have an abundance of during school years. They all know what it means to feel angry, hurt, frightened, furious; it’s not a huge task to think of voice volume, facial expressions, or gestures to demonstrate those feelings. 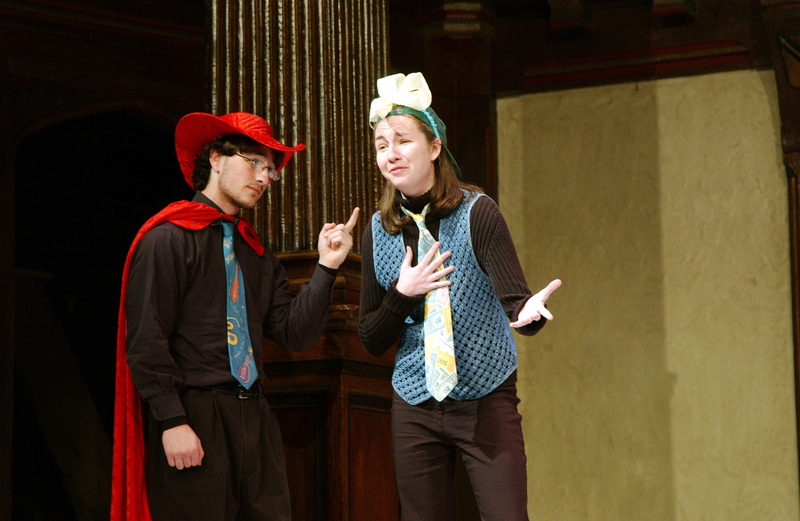 Acting out Shakespeare’s insults creates a great opportunity for students to explore the connections among language, tone, gestures, and meaning. There might be an extended benefit as well. A teacher told me once that she thought students using Shakespearean curses in the halls at school would be a great upgrade from the language she typically hears.